The PR nightmare continues for PwC in the wake of this year’s Academy Awards, during which the accounting giant somehow mixed up the envelopes announcing the coveted “Best Picture” award winner. Jaws were left visibly hanging after Warren Beatty and Faye Dunaway handed the golden man to the wrong man. After the debacle, PwC was spotted on Twitter trying to bury their shame amongst unrelated news content about the firm. The distraction was not very effective; CBS News reports that the two individual accountants involved will never work the Oscars again, and the relationship of the entire firm is “under review.” While PwC’s reputation is now tarnished, they may have inadvertently buffed up the image of several other accounting firms just in time for tax season. One man’s loss is another man’s win. Instagram continues to advance its offerings for users. A new feature allows users to post multiple photos at once with a slideshow effect. The digital flip book allows you to post up to 10 photos simultaneously and already has been implemented widely by advertisers on the platform. Marketers can use this feature to relay more extensive messages to their audience, or get creative and compile step-by-step guides for their products and services. Speaking of step-by-step guides, here’s a tutorial explaining how to use the new feature. Wikileaks released its latest batch of CIA documents, a series titled “Vault7.” It’s a cool name, but the contents may be more sobering. The information released this past week includes thousands of documents that describe software tools and techniques for breaking into people’s phones, televisions and other electronic devices. CIA spokesman, Dean Boyd, said of the surprise release, “We do not comment on the authenticity or content of purported intelligence documents.” Michael Hayden, the former CIA and NSA director, tried to further soften the blow by assuring viewers on CBS’ The Late Show that these purported tools would not be used inside the U.S. unless a domestic agency received court permission. The jury is still out on whether these leaked documents will be followed up with additional details, and whether the agency will have to come up with a more pointed public response on the matter. Facebook has finally taken steps towards identifying “fake news” on its platform. The company launched the beta version of a two-pronged initiative back in December, which allows users to “dispute” an article if they think it’s fake. 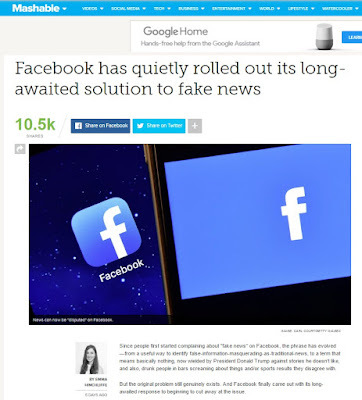 The reported dispute is then passed on to third-party fact checkers who determine whether the article receives the label permanently. Granted, Facebook isn’t known for its transparency, so it’s unclear whether this will be a truly crowdsourced initiative, or whether a select few will have their say on the back end. Meanwhile, be prepared for disputes over whether a news source should be marked as disputed. If you still have reservations as to whether Facebook is doing enough to combat the spread of fake news, take your own initiative and fight the good fight with a sharp infographic. People process visual content 600,000 times faster than text, and retain 80 percent of what they can see, compared to only 20 percent of what they read. This is reason enough to ensure that your visual content doesn’t get buried among all the alternative facts. We’re digging this step-by-step hack for uploading custom-sized graphics along with your Facebook posts.